1. Time Adjustment – Some practitioners use Number of Months Since Sale (NMSS) as an independent variable to ascertain the rate of growth (+/-) in the targeted price level (aka, time coefficient). While this is acceptable as a lead-up regression to generate the time-adjusted sale price (primary dependent variable), it is however unacceptable as an independent variable going into the valuation regression. The reason is simple: since NMSS would be missing in the unsold population (the model would be applied to), the application would fail. Ineffective modeling. 2. Sales GIS – Testing the representativeness of the Sales GIS is not an easy proposition, forcing many practitioners to skip this sampling test. Sales GIS is often a function of market dynamics, deviating from the Pop GIS. 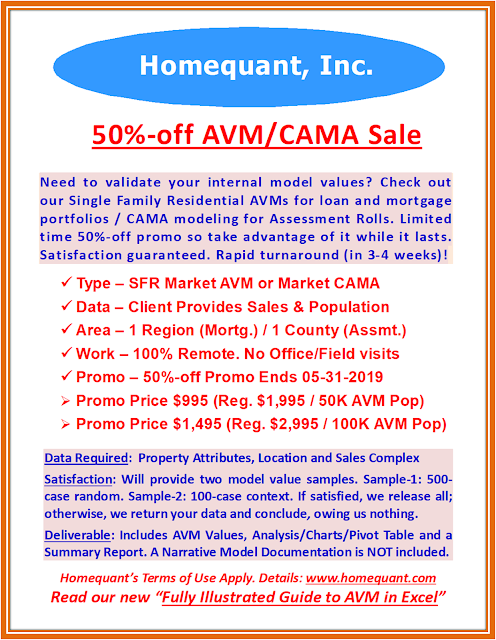 Therefore, an untested Sales GIS paves the way for an inefficient AVM. That is why many practitioners tend to use “fixed neighborhoods” in the modeling process as they are more stable (do not succumb to short-term market swings) and broad-based (liquid enough to test sample representativeness). Inefficient modeling. 3. Chasing Trophies – An AVM is not meant for the entire population. Trying to achieve a two sigma solution (95%) is generally more meaningful, leaving out the admixture of the unattainable 5% including the limited number of trophy properties. It is advisable to leave out those properties from the modeling spectrum altogether (modeling and application). Inefficient modeling. 4. Chasing Tiny Bungalows – The flip-side of the trophies. Especially the waterfront ones (primarily land value). Inefficient modeling. 5. Combining 2, 3 and 4-Family Homes – Modeling 2+ with SFRs is not prudent (mostly income-producing), despite being clustered in the same tax class or mortgage category. Mother-daughter set-up is not a technical two. Inefficient modeling. 6. Synthetic Variables – (X * Y) ^ Z. Talk about explainability and decomposability! Inefficient modeling. 7. Untested Models – Always a good practice to test the model on to a mutually exclusive holdout sample before being applied on to the population. The holdout sample must produce very similar results, both before and after the outliers. Inefficient modeling. 8. Sales Complex – Sales complex, directly or indirectly (SP/SF, etc. ), must not be used as regressors. Violates the basic regression assumptions. Ineffective modeling. 9. Test of Optimality – Since the COD-based regression models do not test true optimality (is COD of 8 better than COD of 10? ), an optimization process (Linear/Non-linear Programming) is in order. Inefficient modeling.